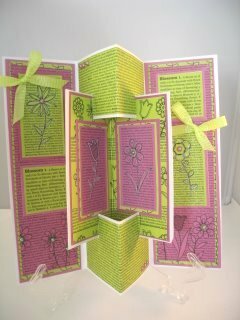 This Concertina Card Tutorial is here if you like to make different styled cards. It is sure to get some comments from the recipient and is not as hard to make as it first seems. But eventually we all get a bit bored with making the same fold over and over again and so we look for something to fire our imaginations. If you prefer to read how to make the card then you will also find the Written Instructions. I have used some double sided card to make mine as this will give a neat effect to the back of the card. But you can also make it from plain cardstock and decorate it as you wish. You will find many more in that section too that you may like to try. So grab a cuppa and make yourself comfortable to watch the short tutorial on this interesting little card. You will need to make sure that the cardstock that you use is of a heavy enough weight to stand up by itself ... as the last thing you want is for the card to keep falling over. Then if you evenly distribute any embellishments that you may add it will help to prevent this, and then make it as pretty as you want. It is one of those cards that will suit any occasion and because it folds up it will fit into an ordinary sized envelope. Making this card with your children will keep them amused for ages, what a good way to spend a wet afternoon, and they will be able to send the finished card to their friends. Maybe as invites to a birthday party. I hope you won't be daunted by the shape and think it is too difficult. Give this fold a try, as the instructions are short and easy to follow.